Novel multiple myeloma (MM) therapies have increased patient longevity but are often associated with notable symptom burden. This study quantified the effect of general symptom level, specific symptoms, and treatment-related adverse events (AEs) on MM patients’ health-related quality of life (HRQoL). 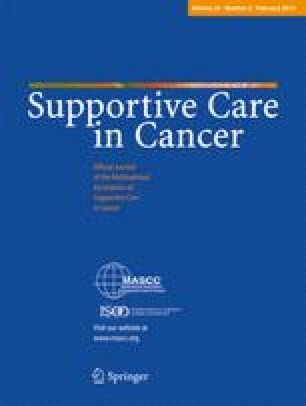 The European Organization for Research and Treatment of Cancer (EORTC) generic cancer questionnaire (Quality of Life Questionnaire Core 30) and MM-specific questionnaire (QLQ-MY20) were used in this study to assess patients’ HRQoL. Data were collected on sociodemographics, disease and treatment history, and the presence/severity of MM-related symptoms or treatment-related AEs from patients with MM in 11 UK and German centers. Multiple regression analyses were conducted. Of 154 patients (63 % male; mean age, 66.4 years; mean time since diagnosis, 3.7 years; 52 % currently on treatment; and 43 % with ≥1 prior MM therapy), 25, 32, 31, and 11 % were severely symptomatic, moderately symptomatic, mildly symptomatic, and asymptomatic, respectively. Fatigue (59 %), bone pain (51 %), sleepiness (36 %), hypoesthesia or paresthesia (33 %), and muscle cramps (31 %) were most commonly reported. Moderate and severe general symptom levels, bone symptoms, depression, and mental status changes were identified as strong determinants of HRQoL. Severity, type of disease symptoms, and treatment-related AEs are important HRQoL determinants in patients with MM, allowing for targeted treatment. Multiple myeloma (MM) is the second most prevalent hematologic malignancy, representing 1 % of all cancers, with an increasing incidence due to population longer life expectancy and increasing prevalence due to improved treatments [1, 2]. According to estimates by the European Network of Cancer Registries, there are 21,420 new cases of MM in Europe annually and approximately 15,000 MM-related deaths. At any time, >77,000 people in Europe are undergoing treatment for MM . Significant progress has been achieved in the treatment of MM in recent decades [4, 5]. The use of high-dose chemotherapy with stem cell transplantation (SCT) improved disease-free survival, and has increased overall survival (OS) compared with standard conventional chemotherapy comprising melphalan and prednisone . More recently, the introduction of novel therapeutic agents has improved treatment response rates and progression-free survival of patients with MM [7, 8, 9, 10, 11, 12, 13, 14, 15, 16]. Improved OS has also been reported in patients treated with thalidomide, lenalidomide, or bortezomib . However, in many cases there is a distinct symptom burden associated with the increased longevity and longer disease course [17, 18]. The management of patients with MM may be improved by a better understanding of the extent to which patients are affected by general symptom level, specific symptoms, and treatment-related adverse events (AEs) and how this, in turn, impacts health-related quality of life (HRQoL). This study was conducted to quantify the effect of patients’ general symptom level on HRQoL, and to identify specific disease-related symptoms and treatment-related AEs associated with HRQoL over and above the patients’ general symptom level. This cross-sectional, bi-national, multicenter study enrolled consecutive MM patients presenting for routine care visits at five UK and six German sites. All enrolled patients were required to understand and voluntarily sign an informed consent form. Eligible patients were aged ≥18 years with a current diagnosis of MM and were representative of one out of four pre-defined study subgroups: asymptomatic, mildly symptomatic, moderately symptomatic, or severely symptomatic. Each study subgroup remained open for enrollment until a quota of 51 patients was reached. Patients were not eligible for enrollment if they had undergone an autograft transplantation within the past 3 months or if they had received an experimental MM treatment. The study was approved by the institutional review boards of the participating Centres and conducted according to the Declaration of Helsinki International Conference on Harmonization and the guidelines for Good Clinical Practice. Written informed consent was obtained from all patients before enrollment. The European Organization for Research and Treatment of Cancer (EORTC) Quality of Life Questionnaire Core 30 (QLQ-C30) and MM module questionnaire (QLQ-MY20) were used to measure patients’ HRQoL. These questionnaires have been shown to be reliable and valid measures for detecting differences in the quality of life (QoL) of patients with cancer and specifically in those with MM [19, 20, 21]. Differences of 6–17 points in selected scores of the EORTC QLQ-C30 have been found to represent a clinically meaningful change in patients with MM, whereby a 10-point reduction can be interpreted as a moderate effect size . A preliminary study by Williams et al. demonstrated that Physical Functioning, Social Functioning, and Fatigue from QLQ-C30; and Future Perspective and Disease Symptoms from QLQ-MY20 are important determinants of Global Health Status/QoL. These subscales were, therefore, the main focus of this paper. Each patient’s general symptom level was determined using an MM symptoms and AE checklist and classification form. This form was developed in English by five hematologists (Drs Hall, Crotty, Oakervee, Che, and Ashcroft), all experienced in treating patients with MM, and then translated into German and administered by the physician during treatment. Patients with MM were asked to provide a score from 1 to 4 for each of 39 MM symptoms/AEs pre-defined as clinically relevant. The list of symptoms/AEs included bone pain, fracture, fatigue, and motor and sensory neuropathy. Final AE severity categories were assigned based on the average score for each grade of symptom/AE. Based on the severity of the reported AEs and symptoms, patients were assigned to one of four symptom groups: asymptomatic if a patient had no symptoms/AEs; mildly symptomatic if a patient reported ≥1 mild symptom/AE and no moderate or severe symptom/AE; moderately symptomatic if a patient reported ≥1 moderate symptom/AE and no severe symptoms/AEs; and severely symptomatic if a patient reported ≥1 severe symptom/AE. Data on HRQoL (EORTC QLQ-C30 and EORTC QLQ-MY20) were also collected at a single patient study visit. The QLQ-C30 comprises a Global Health Status/QoL domain, five functional and three symptom domains, and six AE items. The QLQ-MY20 includes scales for Disease Symptoms, Side Effects of Treatment, Future Perspective, and Body Image. Values for each scale range from 0 to 100. Higher values indicate better HRQoL for the Global Health Status/QoL, Functional, Future Perspective, and Body Image scales. By contrast, higher values indicated a worse HRQoL score for the AE items, symptom domains, Disease Symptoms, and AE scales. Scoring of the QLQ-C30  and QLQ-MY20  scales has been described previously. The site study staff completed a sociodemographics form and a medical history form based on each participant’s medical record. The sociodemographics form included information about age, gender, and nationality of the patients, whereas the medical history form contained data on height, weight, date of MM diagnosis, laboratory tests, presence of lytic bone lesion or pathological fracture at the time of diagnosis, comorbidities, and SCT/MM treatment history. Each line of treatment was classified as containing bortezomib, lenalidomide, thalidomide, alkylating agents, or “other treatments.” Current treatment was defined as the regimen received within 30 days of the study visit. Prior treatment was defined as the MM regimen received within the past 12 months and preceding the study visit by >30 days. The associations between symptom level plus individual symptoms/AEs on the one hand and Global Health Status/QoL, Physical Functioning, Social Functioning, Fatigue, Disease Symptoms, and Future Perspective as dependent outcome variables on the other hand were explored via multiple linear regression analyses. The majority of the symptoms/AEs collected in the study were reported rarely and, as a consequence, different severity levels of AEs included only a few patients. Thus, to allow meaningful analysis, only the presence or absence of the rarely reported symptoms/AEs were considered. In addition to symptom level and individual symptoms/AEs and their severity, the following variables were considered for the multiple regression analysis: age, gender, nationality, body mass index, duration of disease, beta-2-microglobulin and albumin levels at diagnosis, lytic bone lesion or pathological fracture at diagnosis, number of comorbidities present at the study visit, prior SCT, type and duration of current/prior treatment, number of prior treatments, interaction between type and duration of current/prior treatment, response to last cycle of current treatment, and best response to last cycle of (all) prior treatment(s) combined. Given the number of potential predictors of interest and patient sample size (N = 154), multiple regression models were constructed giving priority to symptom severity group and individual AEs. The following strategy was used to prioritize variables of interest: each of the 39 specific AEs was tested in univariate regression models against the six HRQoL measures; those that were statistically significant (P < 0.10) were then tested in a model including the general symptom level. Those found to be significant in this second step were combined in a multivariate model that was then trimmed to exclude items that lost significance. Other potential determinants, like sociodemographics and disease and treatment history variables, found to be significant in univariate analyses were then added to the trimmed multivariate model, which was further reduced by excluding nonsignificant terms. The study enrolled 154 patients (89 and 65 patients from the UK and Germany, respectively). A total of 39 (25 %) patients enrolled in the study were severely symptomatic, 50 (32 %) were moderately symptomatic, 48 (31 %) were mildly symptomatic, and 17 (11 %) were asymptomatic. Average age at enrollment was 66.4 years (interquartile range (IQR), 61.0–74.0) and 63 % were male. The majority of patients (84 %) were of British or German descent. The average time since diagnosis was 3.7 years (IQR, 0.9–5.7). Patients in more severe symptom groups showed a trend towards a higher number of comorbidities (Table 1) and were more likely to be on a current MM regimen (Table 2). The most commonly reported AEs included fatigue (59 %), bone pain (51 %), sleepiness (36 %), hypoesthesia or paresthesia (33 %), muscle cramps (31 %), constipation (28 %), peripheral edema (26 %), and insomnia (25 %). Dizziness (19 %), blurred vision (19 %), dehydration or thirstiness (18 %), infection (16 %), tremor (15 %), sensory (painful) neuropathy (15 %), headache (14 %), depression (14 %), and nausea/vomiting (12 %) were reported less frequently. Other AEs and disease symptoms were reported by <10 % of patients (Fig. 1). Overall, 80 patients (52 %) were on treatment in the month prior to the study visit. Of these, 37 (46 %) patients received regimens based on bortezomib, 17 (21 %) patients received lenalidomide-containing regimens, 15 (19 %) patients had treatments based on thalidomide, 8 (10 %) patients received alkylating agents, and 3 (4 %) patients had other types of treatment. More than half of all patients (57 %) had no prior treatment, 32 % had received 1 prior treatment in the past 12 months, and the remaining 11 % had received ≥2 prior therapies within 12 months of the study visit (Table 2). The overall mean ± standard deviation Global Health Status/QoL score was 60.1 ± 25.5, with the IQR between 41.7 and 83.3. Physical Functioning (mean, 68.7; IQR, 53.3–93.3) and Social Functioning (mean, 63.9; IQR, 33.3–100) scores were slightly higher than Future Perspective scores (mean, 59.9; IQR, 33.3–77.8). Higher symptom severity levels were associated with greater impairments in HRQoL; ≥6-point difference in average score between each level was observed for Global Health Status/QoL, Physical Functioning, and Social Functioning (Fig. 2). The reported mean score for Future Perspective was nearly 20 points higher for asymptomatic and mildly symptomatic patients, compared with patients in the moderately and severely symptomatic groups. Fatigue scores were highest among patients in the severely symptomatic group (mean, 58.1; IQR 44.4–77.8), whereas patients in the asymptomatic group had a mean of 15.7 (IQR, 0–33.3) (Fig. 3). Patients with severe and moderate symptoms had on average 19 and 12 points lower QoL scores, respectively, compared with asymptomatic patients. Patients with severe bone pain had an additional 21-point reduction in score compared with those who had none or only mild or moderate bone pain. Depression and moderate fatigue had similar effects on Global Health Status/QoL scores and each was associated with an 11-point reduction in score. Each additional year with MM was associated with a QoL reduction of 1 score point. Receiving any type of MM treatment within the past 30 days was also associated with a 9.5-point reduction in the Global Health Status/QoL score (Table 3). General severity level was a strong predictor of Physical Functioning; patients with severe, moderate, and mild symptom levels (vs. none) experienced a 24-, 13- and 11-point reduction in their Physical Functioning score, respectively. In addition to the overall level of severe and moderate bone pain, the presence of fracture, moderate fatigue, and moderate/severe infection were all associated with ≥10-point decrease in Physical Functioning score. Longer prior treatment with bortezomib also reduced Physical Functioning levels. Patients who were treated with bortezomib-containing regimens for 111 days (approximately 5.5 cycles of 21-days) had on average a 10-point lower Physical Functioning score compared with patients who had not received prior bortezomib. Thalidomide and alkylating agent-containing treatments had no significant effect on Physical Functioning. Prior lenalidomide and prior other treatments were not tried in the regression analyses because of the low number of patients with a history of these treatments (3 and 6, respectively). British and younger patients tended to report better Physical Functioning (Table 3). Social Functioning was significantly affected by general symptom level. Patients with severe, moderate, and mild symptoms had Social Functioning scores that were on average 34, 24, and 6 points lower, respectively, compared with asymptomatic patients. Fracture, dizziness, and changes in mental status were also associated with a significant reduction in the Social Functioning score (Table 3). Both severe bone pain and fatigue had a strong association with patient Fatigue score; an average increase of approximately 22 points in the Fatigue score was observed in patients with severe bone pain and those with moderate fatigue. Dizziness, sleepiness, nausea and/or vomiting, and a higher number of comorbidities were also associated with increased fatigue level. Patients whose current treatment regimen contained bortezomib, lenalidomide, or alkylating agents/other treatments reported, on average, an increase of ≥10 points in their Fatigue score compared with patients not receiving treatment. General symptom level had no effect on the Fatigue score after individual AEs were included in the model (Table 3). Patients with severe and moderate bone pain reported on average 38- and 18-point higher Disease Symptoms scores, respectively, compared with patients with mild or no bone pain. Muscle cramps were associated with an 11-point increase in Disease Symptoms score. Longer duration of current treatment and being male were associated with an increase in the Disease Symptoms score (Table 4). General symptom level had no effect on the Disease Symptoms score once individual AEs were included in the model. Depression was associated with a 20-point reduction in the Future Perspective score. In addition, headache, sleepiness, German descent, and receiving bortezomib- or lenalidomide-containing treatments (compared with no treatment) were all associated with ≥10-point reduction in patients’ Future Perspective scores. General symptom level had no effect on the Future Perspective score after depression, headache, and sleepiness were included in the model (Table 4). Our study demonstrates that both severity and type of disease symptoms, and treatment-related AEs are important determinants of HRQoL in patients with MM. Higher disease- and treatment-related symptom levels were associated with a lower Global Health Status/QoL and decreased Physical and Social Functioning. For patients with moderate and severe general symptoms, a reduction of 12 and 19 points in Global Health Status/QoL, 14 and 24 points in Physical Functioning, and 24 and 34 points in Social Functioning, respectively, were observed. In addition, we found that specific symptoms/AEs can impact patients’ HRQoL above and beyond their general symptom level. Fatigue was one such symptom/AE associated with reduced Global Health Status/QoL and Physical Functioning, a finding that is in accordance with the limited data currently available on HRQoL in patients with MM . Bone-related symptoms (i.e., pain and fracture) were also important determinants that affected Global Health Status/QoL, Physical and Social Functioning, Fatigue, and Disease Symptoms beyond general symptom levels. A previous study reported that in patients with certain types of malignancies, including myeloma, pathologic fractures correlate with reduced survival . Depression was found to have a very strong negative association with the Future Perspective score. Moreover, mental status changes were associated with a reduction of almost 22 points in Social Functioning score. Similar findings have been reported in other studies [27, 28]. To our knowledge, this is the first study to assess the impact of general severity level of disease symptoms/AEs on patients’ HRQoL and to examine whether specific symptoms/AEs affect the HRQoL of patients with MM more than others. The findings provide an insight for clinicians on how to better treat patients with MM to improve their QoL. These data underscore the need to better manage the treatment of symptoms associated with fatigue and bone-related symptoms because these are the strongest predictors of HRQoL. Our study also suggests that certain aspects of QoL such as Future Perspective, Disease Symptoms, and Fatigue can be improved significantly by targeted treatment of specific symptoms/AEs. Better psychological support aimed at preventing depression and other mental status changes can also greatly improve social functioning and patients’ perception of the future, while better prevention of bone pain, nausea/vomiting, dizziness, and sleepiness can reduce fatigue levels in patients with MM. Cancer patients experience a multitude of symptoms as a result of their disease and/or the treatments they receive. These symptoms often appear in clusters, which may suggest a common underlying cause. For example, the symptom cluster pain, fatigue, and sleep disorder is well established . It has been shown that undertreated pain interrupts nighttime sleep but adequate pain control can reduce sleep problems . Furthermore, fatigue intensity is strongly correlated with the efficiency of sleep and total sleep time . This concept of symptom clustering underlines the importance of treating specific symptoms, such as pain, to improve the general symptom of global fatigue. Results from this study also highlight the need for the treating physicians to consider the overall sum of an MM therapy’s clinical efficacy, its toxicity profile, and its effect on QoL when selecting an appropriate treatment strategy. Our study does have some limitations. Treatment of any type was primarily expected to negatively affect HRQoL through related disease symptoms and AEs, with patients requiring treatment having more severe disease . However, treatment remained a significant predictor in regression models for Physical Functioning, Fatigue, Disease Symptoms, and Future Perspective scales even after adjusting for disease symptoms and AEs. This suggests that some AEs/symptoms may have been underreported, leading to residual confounding in the effect of treatment on HRQoL. As an example, clinical evaluation has shown that as many as 75 % of patients with MM may experience treatment-emergent peripheral neuropathy , whereas only 25 % of patients reported it in our study. Another possibility relating to the significance of individual prior or current treatment variables (in the form of treatment status or type of treatment) is that these may have captured the effect of a multitude of AEs that, individually, were not significant in the multiple regression analyses. Given our limited sample size and rare reporting of some symptoms/AEs, our analyses may have been underpowered to detect additional and potentially important symptoms/AEs, or additional groups of symptoms/AEs that impact patients’ HRQoL. This study showed that, in addition to specific symptoms/AEs, the overall severity level is also an important predictor of patients’ HRQoL. New treatment strategies should, therefore, focus not only on improving disease control and prolong survival but also contribute to optimal symptom management to improve, or at least maintain, patient QoL. Further studies should evaluate whether a specific, patient-focused symptom management program can positively affect QoL in patients receiving new MM treatment regimens. In addition, the assessment of the relationship between pretreatment disease status and treatment-emergent AEs is necessary to determine whether certain types of AE are associated with different Eastern Cooperative Oncology Group (ECOG) performance status. The authors received editorial assistance from Adriana Stan, PhD, and Kathy Boon, PhD, Excerpta Medica, sponsored by Celgene Corporation. This work was supported by Celgene Corporation in terms of investigator fees to the recruiting physicians and consultancy fees to United BioSource Corporation (UBC). Irina Proskorovsky and Jack Ishak are employed by Evidera; Krista Payne and Noreen Lordan are employed by United BioSource Corporation, both companies provide consulting and other research services to pharmaceutical, device, government, and nongovernment organizations. In this salaried position, they work with a variety of companies and organizations; no payment or honoraria directly from these organizations for services rendered is received. Philip Lewis is employed by and holds stock options in Celgene, the manufacturer of Revlimid and thalidomide. Sarah Peters is employed by Celgene—consultancy. Faith E. Davies, Celgene: Speakers’ Bureau; Janssen Cilag: Speakers’ Bureau; Novartis: Speakers’ Bureau; MSD: Speakers’ Bureau. The remaining authors have declared no conflicts of interest.